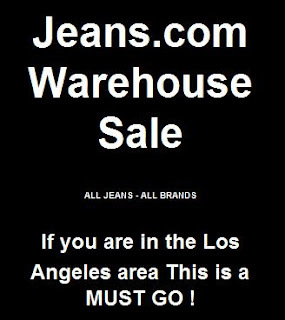 If you're in the Los Angeles area just before Christmas then the Warehouse and Sample Sale at the Jeans.com warehouse located in the warehouse and industrial district of Los Angeles is an opportunity not to miss. With Mek Denim, Siwy Denim, Raven Denim, Nudie Jeans and many more brands at at least 70% Off as well as Food by Kogi BBQ it will be a great time to eat up and bag a pair or two of jeans that sold for $168.00 last year and will be on sale starting at $15.00!!! Described as a ONCE A YEAR SALE. This is RED SATURDAY!!!! The Last Saturday after BLACK FRIDAY. When: Saturday December 18th 2010, from 10:00 am to 4:00 pm. A nice article, Definitely it has a good content. Wow you look gorgeous!! It's like that dress was made for you :p Happy new year, and I'm glad to announce I'm your newest follower, your blog is awesome!! I'm just kicking myself that I missed this, I wonder if they'll have one this year? I could really use some Siwy Jeans! Holly why don't you follow the @ChicAlert on Twitter to hear first hand about fashion sales.